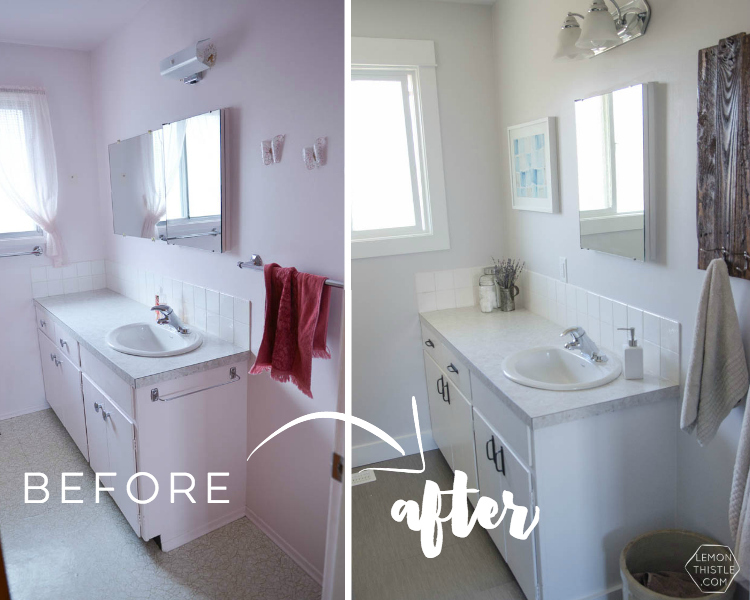 We have been slowly picking away at renovations around here and I’ve been sharing a few room reveals when I realized I never did share our bathroom renovation with you guys! 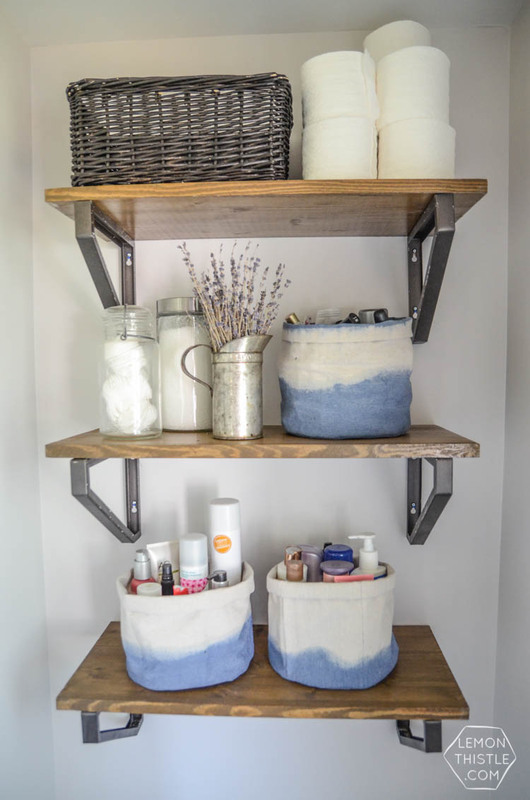 I shared it over at Remodelaholic last year, and since we’ve added some shelving, but did I show you? Nope! So it’s more than about time. 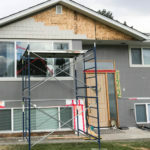 I’m not only going to show you the progress that we’ve made, but I’m going to chat about renovating in phases and why we chose to go that route. Let’s start with the super pink before… shall we? It was in major need of some love. 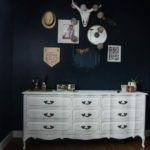 Before we moved in we did a good chunk of this makeover. But then we moved in. And started using the bathtub. And it leaked, friends. Not just little leaks, but BIG awful leaks. We would have plumbers in to fix it- then another leak would start. This went on for months (and about 5 fixes) until we were out of options. It was leaking into our basement suite, our wall was rotting from all the water, the tile surround was cracked and we couldn’t figure out where the leaks were coming from. We had to reconsider our waiting. I should mention that we only have one bathroom in our house (other than our suite), so not using the tub wasn’t an option. But we really couldn’t afford to do the whole bathroom the way we wanted to. We could either do it all at a lower price point (read: nothing special) just to get it done, or we could do the parts we HAD to do to fix the problem, and do another phase of renovations a year or two down the road. Obviously we chose to go in phases. I am really happy with our decision, but I know that phases aren’t for everyone. So Phase 1.5! 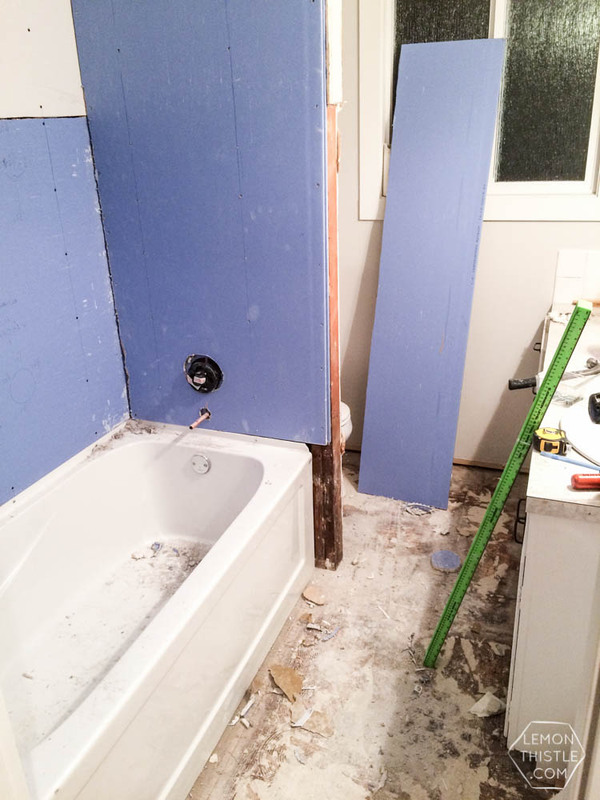 We tore out the bathtub and the flooring, all the damaged drywall, and all the plumbing we could reach before we did anything. 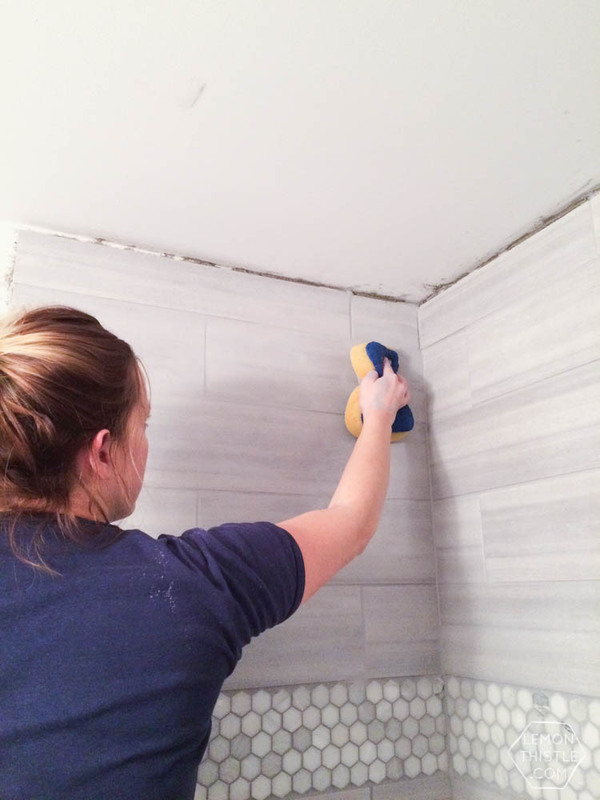 We chose to use the flooring that we had leftover from our kitchen (we had been saving it to do our bathroom floor) on the shower walls to save some cash and avoid buying new stuff. 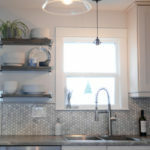 While we paid a plumber to make sure plumbing was done right, I tried my hand at tiling (I had already done the shower in the basement suite and it turned out well). 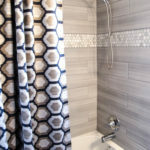 We were short a tiny bit of tile, so decided to use the leftover backsplash from the kitchen (hex) and buy a couple more sheets to make an accent strip around the shower at eye level. Leftovers for the win, I LOVE the way the accent strip turned out. The main tile is called San Marco Viva Linen and pretty much every tile store around here carried it at the time. The hex is straight from The Home Depot. The faucets are Moen (Eva and Iso-we love their lifetime warranty given the leaky things we started with). One of the things that drove us completely crazy with our old shower is that the shower head was SO low. Both my hubby and I are fairly tall, so having to bend down to wash our hair was a pain. 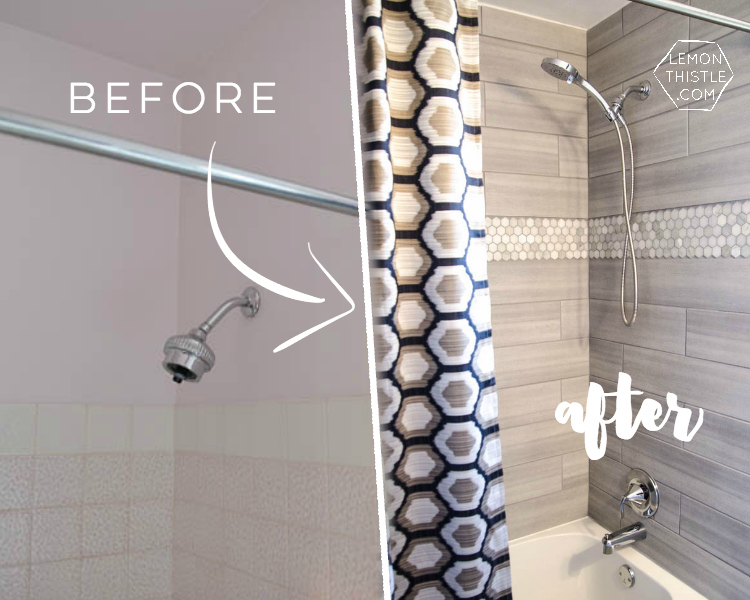 We put our shower head higher than average (such a good decision!) and tiled right to our ceiling (to avoid hiring a drywall finisher). We love the way this looks, but a standard height bar and shower curtain looked silly with the change. I couldn’t find a longer shower curtain anywhere, so I decided to make one. 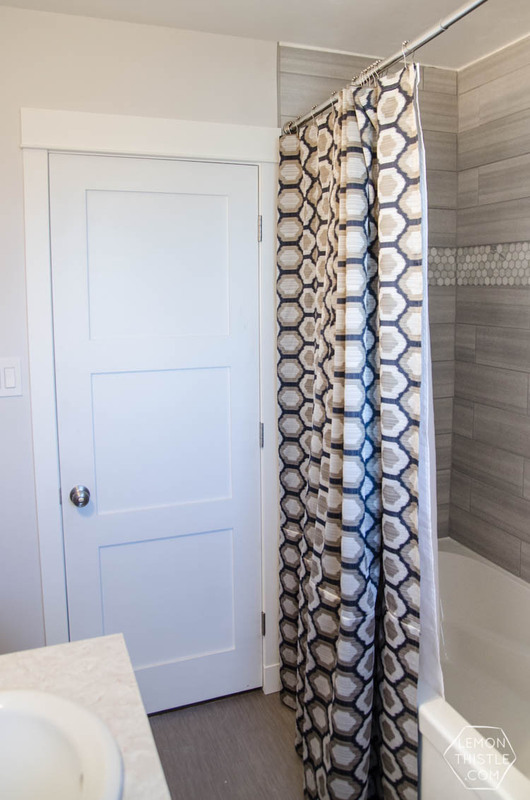 I love the way it turned out- the look of the longer curtain pulls the whole bathroom together. 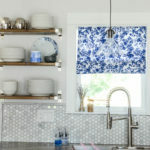 Plus- I wasn’t limited in patterns, I could pick from any fabric because we use a shower curtain liner inside the tub. I shared the whole DIY tutorial for that baby RIGHT HERE. The flooring is also leftovers- we had a swack of leftover vinyl interlocking tile from the basement and sold most of it, but luckily not until after we saved some to do the bathroom floor. We plan to do tile when we finish the renovation. Since this tile doesn’t glue down, we can pull it up to tile and put it in storage in case we have to replace a piece or two from the basement. Let me be clear- we didn’t NEED to re-do the floors. We could have peeled back the old lino enough to see if the subfloor was damaged too much because of the leaks (it didn’t end up being). BUT it was cracked like crazy (which made it hard to clean) and with twin toddlers (18 months when we did this) rolling around, I wasn’t crazy about that. If you were choosing to renovate in stages and didn’t have free floors kickin’ around, this might not be your best option. But, why didn’t you just tile the floor now? We want to put in a new toilet and vanity down the road (Phase 2!) and without knowing the exact sizes and placements? Total waste of time right now. Having a bathroom that I’m no longer ashamed of made me want to decorate it a little bit. To pull the room together, I created a super-quick watercolour painting. I used a piece of poster board I had (the frame is bigger than standard watercolour paper), and painted squares of watercolour- almost like pixels or paint swatches. It’s honestly so simple, anyone could pull it off! 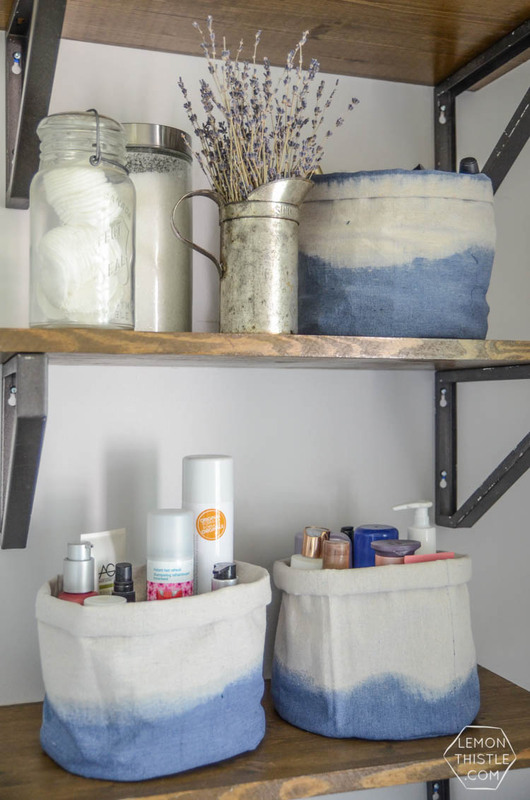 Lastly, we’re all about functionality- so we have a vintage Medalta for our hamper, and an old tin bucket for our trash can (I love that thing!). So this is what it looks like right now! I am really happy with it as-is, to be honest. It’s leaps and bounds (I love that saying) above what we used to have. Even still, I can’t wait for Phase 2! I’m so sick of cleaning this vanity. But it’s been put off until next year, because as any homeowner knows… things come up that are of higher priority than a pretty vanity. 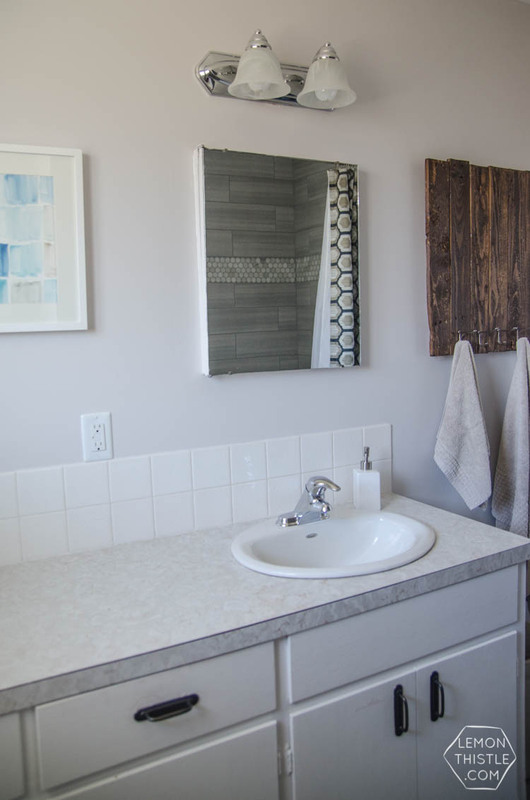 I no longer hate using our bathroom- and waiting a year or more to finish it doesn’t stress me out now. 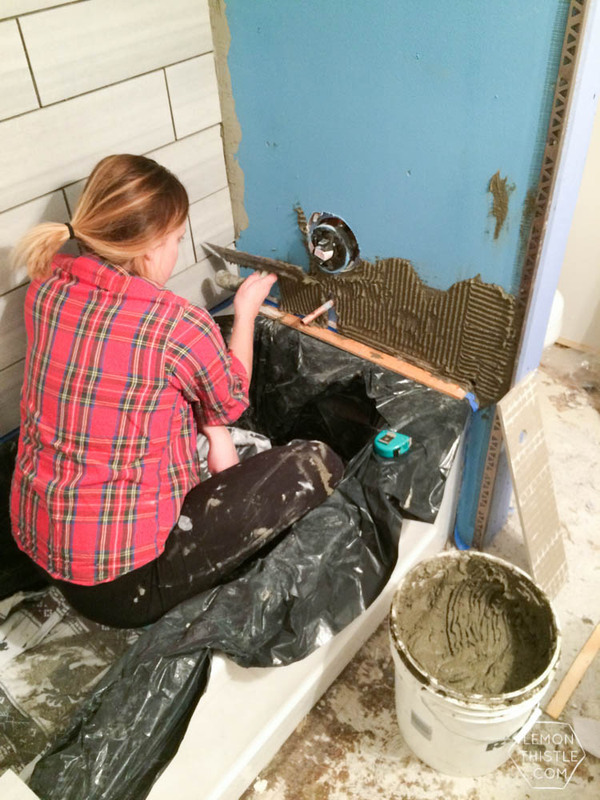 We were able to complete this phase (even with the surprise bathtub) without running up our credit cards, and we aren’t sacrificing the things we love (like a tile floor) for the sake of budget and time constraints. We still have a ways to go though. Oh! And another benefit of renovating in phases? We were only displaced about a week since all of our efforts was focused on that tub. Flooring went down (no grout, mind you) while we were using the bathroom again. So tell me… would you ever renovate in phases? I’d love to hear your thoughts! And if this post inspires a project of you’re own, I would LOVE to see it! Share to my Facebook page, or tag me on Instagram @colleenpastoor. That tile is incredible!!! Great job friend! Looking forward to phase 2! This is gorgeous Colleen! 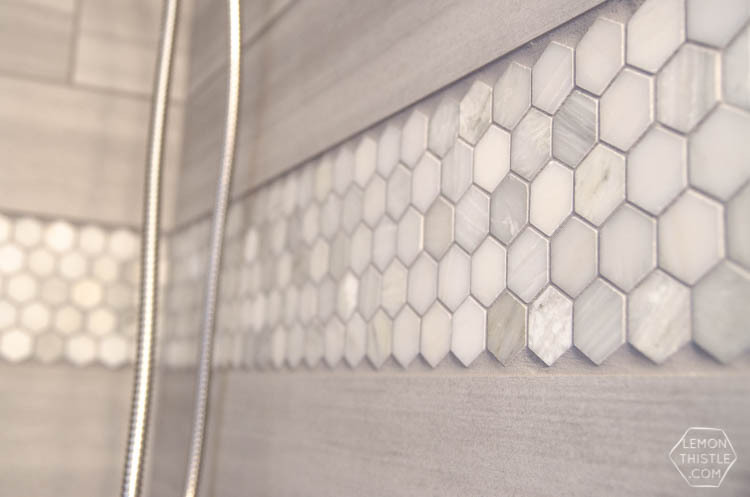 Your shower tile work is what bathroom dreams are made of! 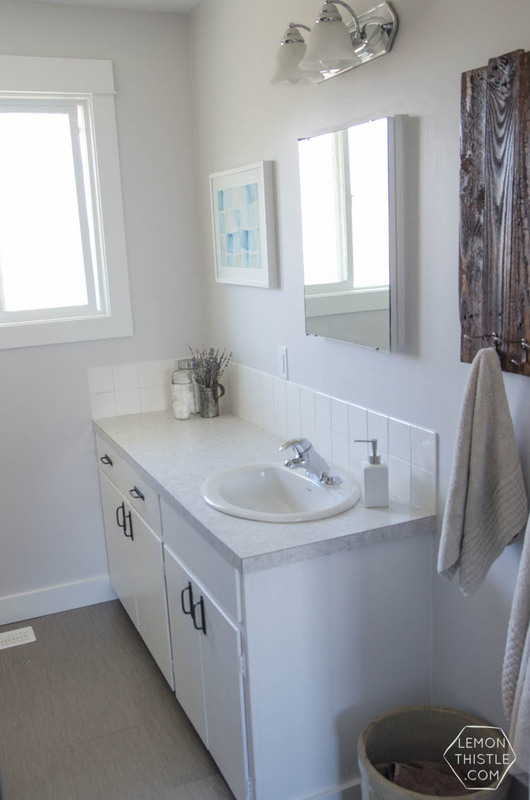 Great bathroom redo! I am sharing this on Pinterest. 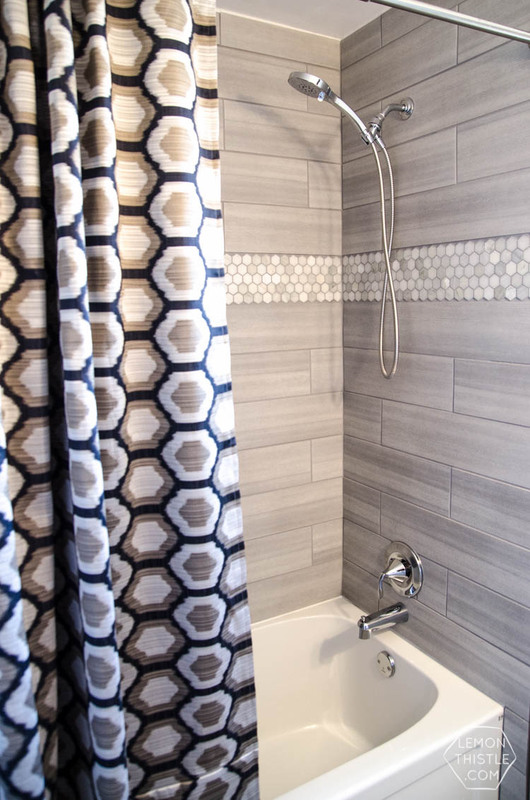 Love the grey tile with the hex pattern accent. What colour did you paint the walls? Where did you get the grey tile? I love it! Thanks so much Erika! I got it from a local tile store, they had it at several at the time. I’ve heard it’s near impossible to get in the US though! I love the bath remodel. May I ask what bathtub you have ? Hi Keri, It’s just a builder basic from our local plumbing supply store! Loving your renos. How much was your budget for the bathroom? If you don’t mind me asking. 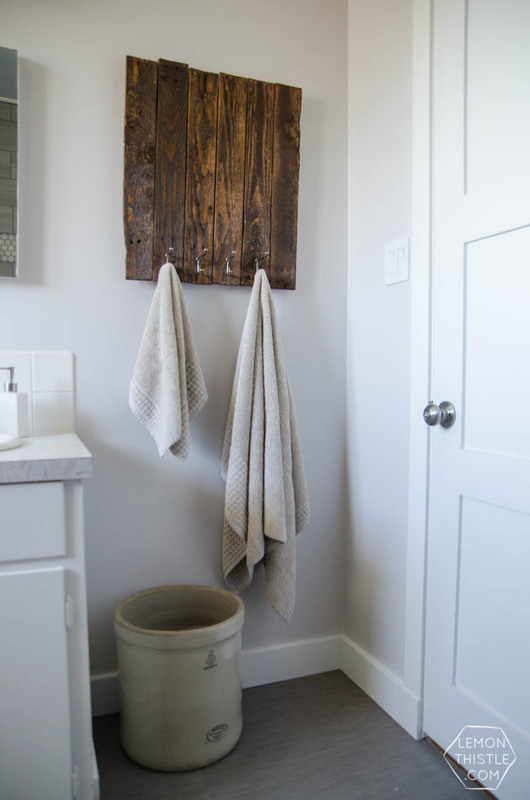 What type of tile is on the wall? 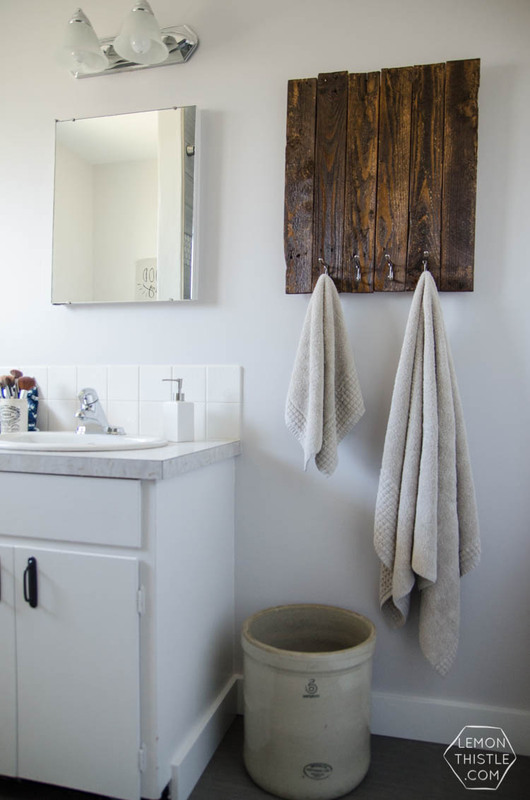 It looks like wood grain ceramic tile..
How did you adhere the mosaic tile? Love the look of it but unsure of how to have it look so clean with the hexagon edges? The tiles are grouted in! Standard mortar and grout :) Clean edges are from a good wet saw! Do you use just regular floor glue to attach the flooring to the wall?? The tile on the wall is traditional tile, attached with mortar. Just the flooring is vinyl. Can I ask what color grout you used? 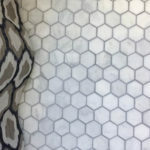 We have the same hex tile in our kitchen, and have not grouted it for over 2 years because we cannot decide on a color. Your’s looks great! Absolutely! Grout is such a tough one! 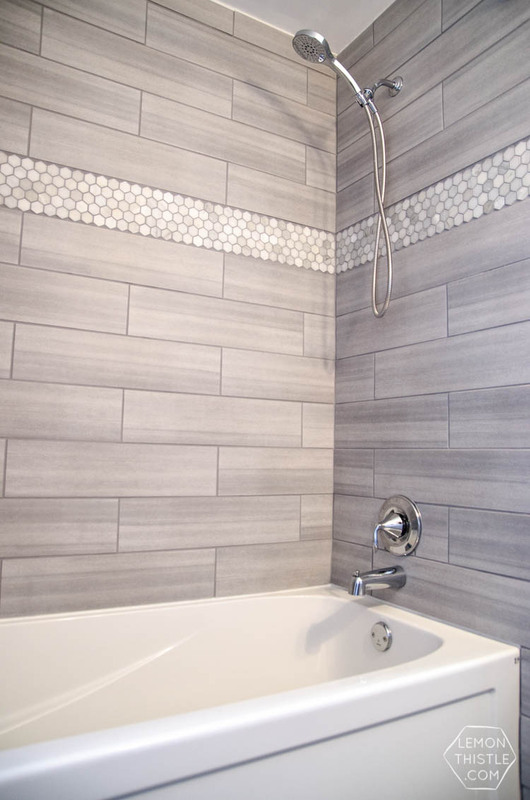 It’s called Delorian Gray and we love how it worked with those tiles. 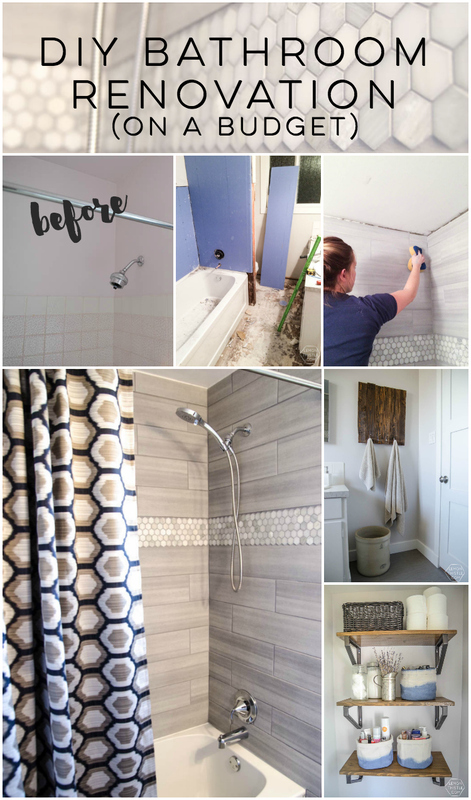 We actually used it on the whole floor when we finished this bathroom (https://www.lemonthistle.com/a-modern-bathroom-makeover-one-room-challenge-reveal/) and in our kitchen with the same tiles (https://www.lemonthistle.com/adding-personality-to-an-all-white-kitchen/).